Boston brown bread with ingredient info: rye flour is available at natural foods stores and some supermarkets.. To make this boston brown bread for 10 persons you will need 20 mins for preaparation and 3 1/2 hours (includes baking and cooling time) for baking. Step 1 Preheat oven to 350°F. Cut two 6″ squares of foil. Coat insides of cans and one side of foil squares with 1 tablespoon butter. Step 2 Stir milk and next 3 ingredients in a small saucepan over low heat until sugar dissolves and mixture is just warmed (do not boil). Step 3 Whisk whole wheat flour and next 5 ingredients in a large bowl. Add milk mixture; whisk until smooth. Step 4 Cover cans with foil, butter side down. Secure foil with kitchen twine. Place cans foil side up in a deep roasting pan or a heavy shallow pot. Step 5 Bake until a skewer inserted through foil into the center of each loaf comes out clean, about 1 1/2 hours. Step 6 Transfer to a wire rack. Let cool for 10 minutes. Run a thin knife around edges of cans. Invert to release loaves onto rack. 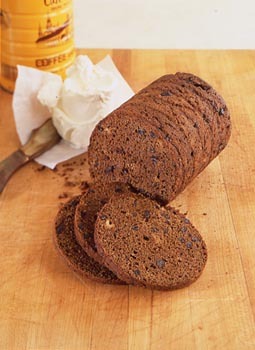 Boston brown bread with *a specialty of new england, brown-bread flour is a mixture of whole wheat, rye and cornmeal or johnnycake meal. it can be purchased already mixed or made by simply combining equal parts of wheat and rye flour and cornmeal..
*A specialty of New England, brown-bread flour is a mixture of whole wheat, rye and cornmeal or johnnycake meal. It can be purchased already mixed or made by simply combining equal parts of wheat and rye flour and cornmeal. Step 1 2. Generously grease a 1-quart pudding mold or 1-pound coffee can. Combine the flour, baking soda and salt in a mixing bowl. Step 2 3. Fill the mold or coffee can with batter. It should come up about two-thirds of the way. Cover the top with foil and tie securely with a string to make it airtight. Step 3 4. Place in a deep baking pan and fill the pan with boiling water, to come halfway up the side of the mold. Step 4 5. Place in the preheated oven and allow to steam for 2 hours, checking the water level after 1 hour. Step 5 Add more boiling water if needed. Check by sticking a skewer into the bread; it will come out clean when done.